This blue kurti with 3-4th size sleeves is looking beautiful and elegant. Ideal for women and girls, this kurti is designed using ..
Made-up with net fabric, this kurti in american rose colour has white designer net on the top of it. There is a flower on the left..
A very pretty cotton kurti in turquoise colour with 3-4th umbrella cuts sleeves is designed for women and girls. This simple yet t.. This purple kurti with 3-4th sleeves is looking beautiful and elegant. 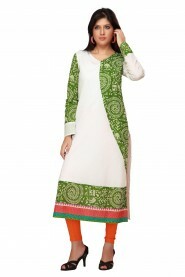 Ideal for women and girls, this kurti is designed using pri.. This sleeveless kurti in white and yellow combination is made-up using chiffon fabric. With button pattern on the neck, this kurti..
A stylish kurti is georgette it is looking very trendy in creamish white and green combination with a floral pattern in a side pan..
A very pretty cotton kurti in pink colour with 3-4th umbrella cuts sleeves is designed for women and girls. This simple yet trendy.. This black kurti is looking beautiful and elegant with 3-4th sleeves. Ideal for women and girls, this kurti is designed using prin..
Made-up with cotton fabric, this white frock midi has floral pattern design with banded neck. With skiny straps, the checked patte.. Suitable for office as well as casual wear, this plain sky blue cotton kurti has green printed collared neck. With full sleeves, t.. This pink kurti with 3-4th sleeves is looking beautiful and elegant. Ideal for women and girls, this kurti is designed using print.. This geaorgette kurti comes with an inner wear. 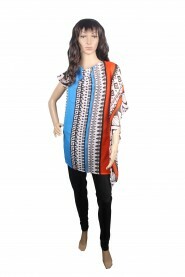 with printed pattern, this kurti has unique colour combination of blue, orange and..
With White print, this black printed kurti has round neck with a V-shape design in bottom neck. The neck is embroidered using blac.. This Yellow kurti with 3-4th sleeves is looking beautiful and elegant. Ideal for women and girls, this kurti is designed using pri..
A very simple yet eye-catching cotton kurti in black colour is available with collared neck. With button, the neck is embroidere..
An eye catching floral pattern in different shades of rainbow and the midnight blue backdrop and complementing each other perfectl..
A simple yet stylish kurti made-up with qualitative cotton fabrics has balloon-style 3-4th sleeves. Available in royal blue colour..
Made-up with soft net fabric, this kurti in blue colour has white designer net on the top of it. There is a flower on the left s.. This rani pink colour kurti is looking beautiful and elegant. Ideal for women and girls, this kurti is designed using printed pure.. This printed yellow cotton kurti has excellent marron colour print. With black bordered collared neck, this kurti comes with full ..